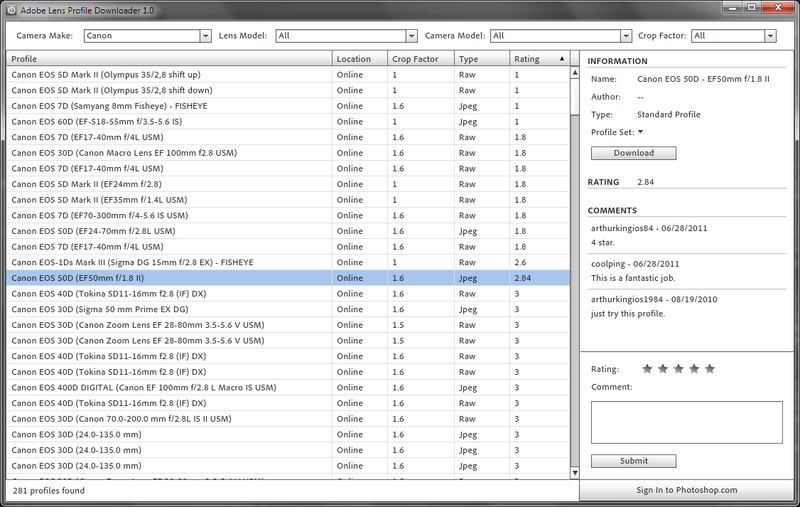 Where can I find user created camera and lens profiles for Lightroom 3 and Camera Raw 6.1? The new Lightroom 3 and Adobe Camera Raw 6.1 have a lens and body database included to automatically correct your image. But the problem is, for Nikon and Canon, only a limited set of lenses and bodies are included, Adobe has released a program to create your own lens profiles but I haven't been able to find a community which posts their profiles. I image a nice database for this could be created to share these profiles with others. So is there a community which shares these profiles or does everyone keep the profiles private? To clarify, yes I know that in Photoshop you can search for other submitted profiles, but it seems to lack quality control and cannot be used in Lightroom. After asking this question and searching some more I found a Adobe employee confirming they were creating a site for this purpose. See: [suggestion] shared profiles server. You can install the Adobe Lens Profile Downloader (not the Creator). The Downloader will let you download and install user-created lens profiles, and they will work with Lightroom, Camera Raw, and Photoshop. Adobe Lens Profile Downloader is a free companion application to Photoshop CS5, Photoshop Lightroom 3, and the Camera Raw 6 plug-in. It allows customers to search, download, rate and comment on the online lens correction profiles that are created and shared by the user community. Not the answer you're looking for? Browse other questions tagged lightroom post-processing or ask your own question. Why aren't there Tokina lens profiles in Lightroom, and how do I get one for mine? Where can I get free RAW files online for practicing with Lightroom? How do you add lens profiles to Adobe Lightroom?